Synonym: Ananas nanas, Ananas sativus, Ananas paraguyensis, Bromelia ananas, Bromelia comosus. Other names: Ananas, abacaxi, ananas. 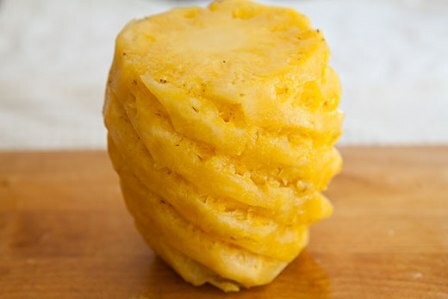 PINEAPPLE, though a native of Brazil, is now grown and relished all over the world. 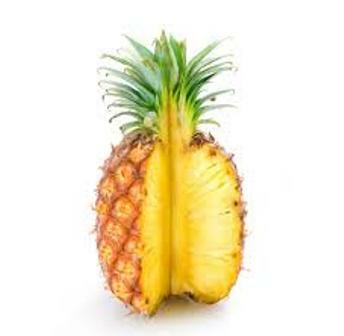 A good source of vitamins A and B, pineapple is fairly rich in vitamins C, calcium, magnesium, potassium and iron. It is also a source of bromelin, a digestive enzyme. Pineapple is a crop of humid tropics. The fruit grows well near the sea coast as well as in the interior, so long as the temperatures are not extreme. The optimum temperature for successful cultivation is 22`-32`C. Leaves and roots grow best at 32`C and 29`C respectively. Their growth ceases below 20`C and above 36`C. A high temperature at night is deleterious and a difference of at least 4`C between day and night temperatures is desirable. It can be grown up to 1,100m above mean sea-level, if the area is frost-free. Although optimum annual rainfall fro its commercial cultivation is 100-150cm, it grows remarkable well under a wide range of rainfall. In areas where the rainfall is less, supplementary protective irrigations are necessary during dry season. The plants come up well in any type of soil except a very heavy clay soil. Sandy loam soils are ideal. The soil should be 45-60 cm in depth without hard pan or stones. Low-lying areas high water able should be avoided. The plants prefer a soil pH of 5.0-6.0. It is a leading commercial variety valued particularly for canning. Its fruits are big-sized (1.5-2.5kg), oblong and tapering slightly towards the crown. The fruit with broad and shallow eyes becomes yellow when fully ripe. The flesh is light yellow, almost fibreless and very juicy. The leaves often have a short sector of small margin of spines just behind the tip, and irregularly on the base near its attachment to the stem. Cultivated in certain regions of West Bengal, it is synonymous to Kew except the size of plant and fruit which are larger than Kew as the name signifies. It is partially cultivated in Kerala and Goa. The fruit is similar in taste and other characters to that of Kew. Widely grown in Tripura, and partly in Assam and Meghalaya, its fruits are rich yellow in color, weight 0.9-1.3kg each. The flesh is deep golden-yellow less juicy than Kew, crisp textured with a pleasant aroma and flavour. Eyes are small and deep, requiring a thicker cut when removing the skin. The leaves are brownish-red, shorter and very spiny. A mid-season variety of the Queen group, it is grown in some parts of Kerala. Medium in size, its fruits are deep yellow and red. Yellow fruits are oblong, fibrous and medium sweet compared with red ones. This is ideal for table purposes. These are tow indigenous types grown in Assam, both being named after the place of their production. Both are under Queen Group with fruits smaller than Queen. Lakhat is markedly sour in taste, whereas Jaldhup has its sweetness well-blended with acidity. The fruits of Jaldhup again have a characteristic alcoholic flavour of their own and can be easily distinguished from other fruits of the Queen group on the basis of this character alone. The performance of the plant depends on vigour, growth rate, and time taken for bearing, fruit size and quality of planting material. Besides type and size of plant material also results in variation in the performance of plants. If planting material of different types and sizes is used, it results in poor rate of plant establishment, uneven growth of the plants, uneven flowering and harvesting stretched over a long time. Uniform cultural operations cannot be taken up. Ultimately plant-wise operations are to be followed resulting in increased cost of production. In a mixed planting, a few plants flower while others become ready for harvesting, posing problems for getting good uniform ratoon crops also. Therefore, it is always advisable to use uniform-sized material to monotype. Hence, selection of right type and size of planting material is essential for commercial plantings. In suckers and slips, larger planting material results in more vigorous plants. Of the types and sizes of propagules tried, slips and suckers weighing about 350 and 450g respectively are ideal for higher yield with better produce. For Coorg (Karnataka) and Jorhat (Assam) suckers and slips weighing 501-750g and 301-400 g are ideal planting material. Suckers weighing 501-1000g is the best material for Thrissur (Kerala). In case of non-availability of slips, suckers weighing about 500g are ideal. If sufficient suckers are not available, slips weighing about 350 g are best. Time of planting is dictated by the season in which the first plant crop is required. Planting time is very important for natural flowering period, which differs from region-to-region. By the time of natural flowering, if they plant does not attain the optimum physiological maturity, either it escapes flowering the next season or if flowering is induced in the same season, the plant, bear very small fruits. Hence, the ideal time of planting is 12-15 months before the peak flowering season under natural conditions, which varies from December to March in different regions. Time of planting also varies from place-to –place depending upon the time of onset of the monsoon and the intensity of its precipitation. In Assam, planting should be done during August-October, while in Kerala and Karnataka; the best time of planting is April-June. Delaying in planting as late as September, delays crop at least by 7-9 months. The peak flowering under these conditions comes during January-March. The ideal time for planting in North West Bengal is October-November and June-July for other parts. System of planting varies according to land and rainfall. There are four planting systems-flat-bed, furrow, contour and trench. 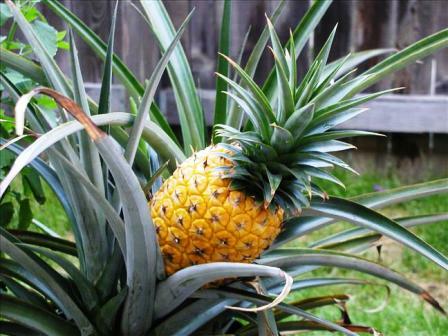 Plant density of pineapple depends on growth of the plant and system of planting. Adoption of low-planting densities has been the major constraint in India, contributing to high cost of production. The plant density of 63,400 plants/ha (22.5cm x 60cm) is ideal for subtropical and mild humid conditions, whereas for hot and humid conditions a plant density of 53,300 plants /ha spaced at 25 cm from plant-to-plant within a row, 60cm from row-to-row and 90 cm from trench-to-trench (25cm x 60cm x 90cm) provides high yield. In rain fed, high fertile and hilly areas in north-eastern stats, a plant density of 43,500 plants/ha spaced at 30cm x 60cm x 90cm is recommended. The yield of 70-105 tons/ha may be obtained under high –density planting does not have much adverse effect on fruit size, quality and canning recovery. Less weed infestation, protection or fruits from sun-burn, increased production of propagules (suckers and slips)/ unit area and non-lodging of plants are added advantages of high-density planting? Pineapple is a shallow feeder with high N and K requirement. Since these nutrients are prone to heavy losses in soils, practices relating to time of application and form of fertilizer determine their efficient use. 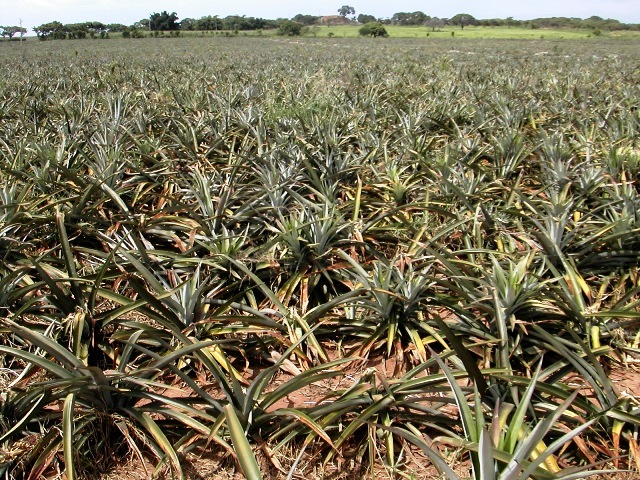 Application of 12gN /plant for Kew pineapple is ideal to obtain high yield at Bangalore, Chethalli (Karnataka) and Thrissur (Kerala). A dose of N, P2O5 and K2O at 12, 4 and 12g/ plant/year respectively is optimum under Jorhat conditions. No response to P application has been observed. However, in the ratoon crop four gram P2 O5/plant increases fruit weight and yield. Plants receiving 12 g K2 O plant /crop give higher yield without any adverse effect on fruit quality both under irrigated and rain fed conditions. For medium –fertile soils in West Bengal, N (12-16g), P2 O5, (2-4g) and K2O (10-12) /plant are optimum. It is thus advisable to apply N and K2O each @ 12/plant. There is no need for P application. However, if the soils are poor in P, 4g P2O5 / plant can be applied. The N should be applied in 6 split doses. The first dose of N can be given two months after planting and the last one 12months after planting. The K should be given in two split doses. Entire p and half of K can be given at the time of planting and the remaining K6 months after planting. Application of fertilizer under rain fed conditions should be done when moisture is available. Earthing up: This is an essential operation in pineapple cultivation aimed at good anchorage to the plants. It involves pushing the soil into the trench from the ridge where trench planting is a common practice. As its roots are very shallow, the plants are eventually lodged especially under flat-bed planting in heavy rainfall areas. Lodging of plants at the time of fruit development results in lopsided growth, uneven development and ripening of fruits. It is more important in ratoon crop as the base of ratoon plants shifts up, crop after crop. High –density planting minimizes its necessity as the plants prop each other preventing lodging. Weed control: Weeds could be effectively and economically controlled by application of Diuron (3kg /ha) or a combination of Bromacil + Diuron @ 2kg/ ha each as pre-emergent spray and repeated with half of the dose, 5 months after first application. The quality of each herbicide should be mixed in 1,000 liters of water for a hectare of crop. Mulching: It is essential to conserve soil moisture. Though mulching is not a common practice in India, use of dry leaves or straw is in practice in south India.